Jason Becker’s story is one of brilliance, talent, determination, adversity, and, ultimately, triumph. A child prodigy on guitar, Jason rose to prominence as a teenager when he was one half of the legendary rock guitar duo Cacophony (with his great friend Marty Friedman). After wowing audiences all over the world with his amazing guitar chops and deep compositions, Jason got a gig with David Lee Roth, following in the huge footsteps of Eddie Van Halen and Steve Vai. He wrote and recorded the DLR album A Little Ain’t Enough and was poised to take over the rock guitar world when a nagging pain in his leg was diagnosed as ALS, or Lou Gehrig’s Disease, a debilitating and fatal condition with a life expectancy of maybe five years. Today Jason’s busier and more prolific than ever, as evidenced by Triumphant Hearts. Many of the guitar parts are performed by a who’s-who of 6-string gods including Joe Satriani, Steve Vai, Neal Schon, Steve Morse, Paul Gilbert, Joe Bonamassa, and many others. And, in what will absolutely delight his fans, Jason’s amazing guitar playing—recorded in the ’80s and ’90s—graces several tunes. 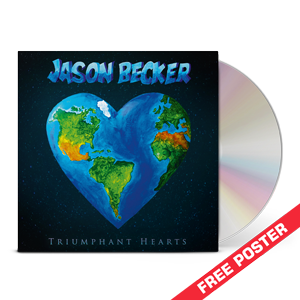 Triumphant Hearts will be released worldwide on CD, double vinyl and digital. 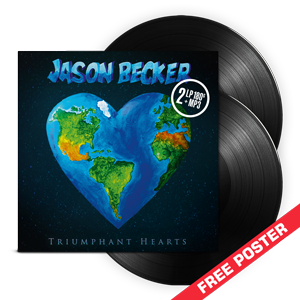 The double vinyl includes a code for a complimentary MP3 download of the album. Free poster with every pre-order from the Official MLG store! Official video for Valley Of Fire featuring guest performances by Michael Lee Firkins, Steve Vai, Joe Bonamassa, Paul Gilbert, Neal Schon, Mattias IA Eklundh, Marty Friedman, Greg Howe, Jeff Loomis, Richie Kotzen, Gus G., Steve Hunter and Ben Woods.